Welcome to Antiques & Moore! 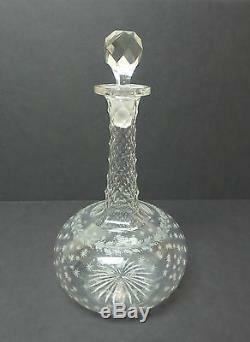 This listing is for a wonderful antique cut and engraved crystal decanter with stopper. This lovely decanter has an incredible diamond cut long neck with engraved leaf swag around the upper body and intricately engraved star design on lower round body. Deep cut star cut in center bottom and diamond cut matching stopper. 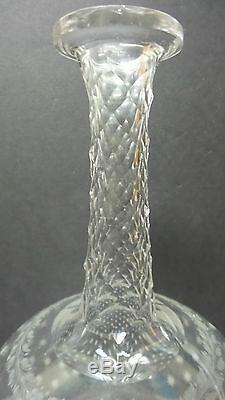 This decanter is in excellent condition with no scratches, chips, cracks or repairs. There is some minor faint cloudiness on the interior base of the bottle that we have not tried to remove (see photos). The stopper has a facet cut and fits correctly and is believed to be original to the decanter. The stopper has a couple of tiny no-harm nicks on the bottom edge (see photos). Overall, the stopper is in very good condition. Measures 10" high (with stopper inserted) with a top diameter of 1 7/8" and maximum width of 4 3/4 in diameter. We at Antiques & Moore have been in the Antiques business for over 30 years and try to describe our items as accurately as possible. We are happy to answer any questions and always appreciate your business! 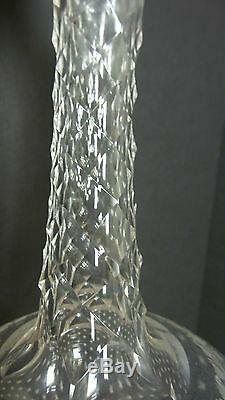 The item "ANTIQUE DIAMOND CUT & ENGRAVED CRYSTAL DECANTER w / STOPPER" is in sale since Thursday, August 20, 2015. This item is in the category "Collectibles\Barware\Decanters\Pre-1970".